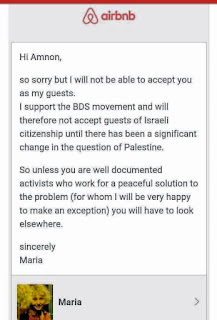 I have read what you wrote to Amnon when he sought to be your guest via airbnb. I think that you have really lost a great opportunity to expand your knowledge and understanding of the issues that currently exist between Israel and the Palestinians. I am sure that hosting Amnon would have been an eye-opener for you. I wish to take the liberty to explain here what Amnon may have told you if you had been open-minded enough to have him as your guest. Having followed the activities of the BDS movement over a number of years, I wonder whether the movement’s supporters like yourself really understand what BDS is about. People like you appear to support BDS in the belief that isolating Israel will promote a peaceful solution between Israel and the Palestinians. Even though your objective is honourable, you are bound to be disappointed by the achievements of BDS. The BDS movement and its activities are first and foremost directed towards hurting and destroying Israel. The BDS idea was originally to protest Israel’s presence in Judea and Samaria (the so-called “West Bank”) by exposing and boycotting Israeli products produced in these areas. Instead, the organisation has been hijacked by anti-Israel and anti-Semitic individuals, who try to convince people like you that BDS is an honourable cause that promotes peace. And this can be achieved by behaving in an anti-Semitic way, just like you did on airbnb. But all that they are really doing is trying to promote anti-Semitism and hate towards Israel in a politically acceptable manner. If you are prepared to examine the issue in greater depth, you will discover that the main obstacle to peace is the unwillingness of the Palestinians to recognise Israel’s right to exist as a Jewish state. This is demonstrated by their refusal to remove from their charter, the objective to destroy the Jewish state. So, if BDS was really an organisation that promoted the idea of peace between Israel and the Palestinians, it would protest against the Palestinians’ stated objective, and against their continued attempts to destroy Jews and the Jewish state. If you are looking for activists working towards a peaceful solution, you will find that the majority of Jews in Israel are activists working towards a peaceful solution. There are few Israelis who do not yearn for a more peaceful environment to raise their children, and to find a peaceful way to co-exist with our neighbours. Don’t forget that Israelis are happy to welcome Arabs, even so-called Palestinian Arabs, into their towns and cities to sit alongside them in coffee shops and restaurants. As long as they come in peace. You will find Arabs in every Israeli town and city, in malls up and down the country and working in Israeli businesses. The same cannot be said for finding Jews in the Palestinian Authority area. Their areas are “Judenfrei”. And it is this type of behaviour that the international community and BDS reward by criticising and castigating Israel at every opportunity. If you are indeed ready to make an exception for activists working for a peaceful solution, Amnon is probably the person that you should make your exception for. Or any other Israeli who wishes to be your guest. We all dream about peace, and are prepared to give a great deal to achieve it. Don’t forget, however, that Israelis are not prepared to seek out peace at any price. They are not prepared to do it in a way that ultimately ends up destroying the Jewish state. After all, this is hardly peace. If the Palestinians were prepared to recognise Israel’s right to exist as a Jewish state, they will find willing partners in Israelis to shake their hands and to find ways to co-exist in peace. If not, Israelis are unafraid to fight for their rights and for their survival. We are a tough bunch of people who never give up. It is unfortunate that BDS has managed to convince people like you that it is fighting for peace, and to cause you to become anti-Semitic in your actions. The people who are really fighting for peace are not the Palestinians, and not the BDS activists. They are the Israelis. If you give them a chance to prove it, you will never be disappointed. I am sure that you will have the chance to discover this first-hand if you host Amnon as your guest. And even though you may have been influenced by BDS and by the media in your thoughts and actions, you do need to take some responsibility for the way in which you have treated Amnon. It is anti-Semitic, bigoted and unacceptable.